Phillies add new faces for 2010, but will start season "Harry-less"
With pitchers and catchers set to report to Clearwater in a few weeks to begin training camp, a handful of new faces will be among the 2009 National League Pennant winners. One familiar, smiling face will be missing. That, of Hall of Fame broadcaster, Harry Kalas. Since 1971, generations of Phillies fans have listened to the soft-spoken announcer with the golden voice, but this year it will be different. Kalas passed away last April during the season. Whether he was describing the on-field play of a last place team with Willie Montenez, Barry Lersch and Denny Doyle, or the 1980 World Champions that included Mike Schmidt, Pete Rose and Tug McGraw, or the 2008 World Champs of Jimmie Rollins, Ryan Howard and Chase Utley, he was there for us. We went along for the ride, pitch by pitch, hit by hit, out by out, and the occasional "That baby's outta here! Home run...(fill in the blanks)! No one will pronounce those household names in Phillies pinstripes quite the same: "Michael Jack Schmidt," "Mickey Mor-en-din-i," "Garry Lee Maddox." A dozen years ago, we lost "His Whiteness," Richie Ashburn, and gone in a blink was "Whitey's famous comment, "Oh, brother!" That and a bucket of baseballs filled with humorous stories that kept the fans entertained, even when the home team couldn't. He was one of the reasons we tuned into the game. We thought we'd survive without Whitey, and with Harry, but here we are. We are trying to win our third straight pennant, and Harry's not here to take us through it. He's not here to revel in it with us. He's not here to enjoy the victories or soften the defeats, and that is going to be tough. 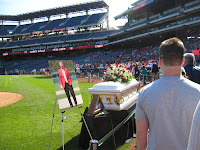 Last spring, when 10,000 devoted fans showed up at Citizens Bank Park to bid Harry farewell, you knew he was more than a great voice over the airwaves. He was a great human being. There was an outpouring of emotions and stories from those whose lives he touched. Within weeks, a book was published containing many of the memories people had about him, and wanted to share with the rest of us. In the mid-1970's, my father befriended Harry Kalas through letter-writing, hanging out at Veterans Stadium after games hoping for a quick conversation, and by tracking him down at the bar at the team's hotel at various away games. Never did the avid Phillies fan ever take advantage of their friendship by asking for free tickets, baseballs, autograph's, etc. All he wanted was a chance to talk about the game over a gin and tonic with one of his idols. The highlight of their friendship came when my father invited him for a drink at the local V.F.W., in Pottstown, and Kalas obliged. When the two walked through the door of the club, jaws dropped. In May 1997, in the midst of the baseball season, Harry Kalas took time out of his busy schedule to attend my father's funeral. He was that kind of guy. The 2010 campaign officially kicks off with a Spring Training game on March 4 vs. the New York Yankees. Go figure! The Phils added a new ace to the staff, with Roy Halladay finally making his way from the Blue Jays, and we say goodbye to Cliff Lee, who's off to Seattle. We welcome back Placido Polanco, who will replace Pedro Feliz at third.